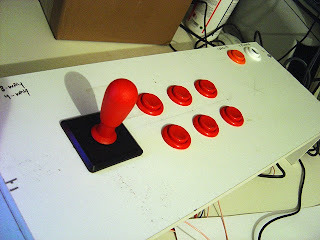 With the control panel (CP) parts i'd ordered (pushbuttons, joysticks, wiring and I-PAC) my brother and I started building a test panel. Stripping wires first and then attaching the crimp connectors. So no soldering required, easy! With a 28mm drill I made some holes in the board to stick the buttons through. The joystick I use now is an easy-mount stick (E-Stik). Not super fond of it but it mounts very easy - just like a button. Luckily, I have a couple of Happ Competition joysticks waiting for the final CP. Top of the test CP. After playing with the buttons they seem too far apart and not really aerodynamicly set up. But hey, it's just a test panel. 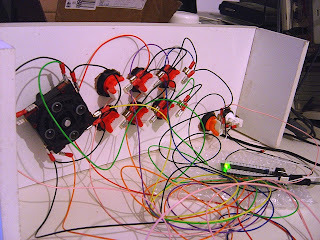 The wiring doesn't look like we did a very good job. But in fact, if we'd tierap it, you could see it's actually properly done!